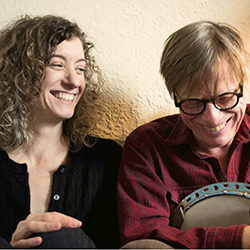 Acclaimed folk duo Kieran Kane and Rayna Gellert will perform in concert at the Muskegon Museum of Art’s Frey Foundation Auditorium on Saturday, April 27, at 7:00 pm. Tickets are available at the MMA Store or by phone at 231-720-2580. Concert tickets are: $20 in advance/$15 for MMA Members/$25 at the door. Purchase online here, at the MMA Museum Store, or by phone at 231.720.2580. MMA Members must purchase at the MMA Store or by phone to receive discount. Doors open at 6:30. Beer and wine will be available at a cash bar prior to the concert and at intermission.